Just a day after President Obama called attention to 2012's major weather disasters and their link with global warming, new research is showing that the time to act is now (or has passed if you're pessimistic). A new study by Ezer et al. in February's Journal of Geophysical Research:Oceans traces the link between rapidly rising coastal waters in the Mid Atlantic and a slowing Gulf Stream. The researchers found that global warming has slowed the Gulf Stream, and that the correlation between the slowing GS and sea level rise (SLR) is extremely high (-.85 with more than 99.99% confidence it isn't 1). In an interesting twist, the paper states that SLR is not equal across the coast, but instead seems to be rising faster in the southern Mid Atlantic region close to Cape Hatteras. This doesn't, of course, mean that the rest of the East Coast is spared, but it might possibly mean that major American cities have time to plan accordingly. The article in Geophysical Research dovetails nicely with an interesting article in The New York Times detailing flood control in the Netherlands. Because of SLR, Hurricane Sandy, and general threats to New York City from rising waters has forced lawmakers to think about ways to make the city safer- not just for another hurricane, but for the eventual rise of water that is coming. Michael Kimmelman's article compares the Netherlands approach to water management to New York's. In the past, water control in the Netherlands was mainly about keeping water out- building dams that pushed water resources where the government wanted them to go. But Kimmelman notes in his article that this approach is changing. Instead of keeping the water out, the Dutch are starting to let the water in. In the past, the Dutch government had sea levels down to an exact science- how high do you have to build a wall to keep the water out in each season? What's the highest it will get in 100 years, 200 years, 2000 years? But global warming has changed the numbers, or more accurately, obfuscated them. Who's to say how high you would have to build a sea wall to keep the water out when scientists' predictions about sea level are being obliterated by new data? So the Netherlands has decided to go with the flow, and work out infrastructure that will allow water fluctuations that no one can foresee. This seems to e the tack New York's governor is hoping to take as well. Although he initially gave the green light for a series of sea walls after Hurricane Sandy, New York Governor Andrew Cuomo proposed to spend $400 million dollars to buy beach front property homes in the state damaged by the storm. The homes would then be razed and the land would stand vacant from human habitation, but instead would be repurposed as sand dunes, wetlands, bird sanctuaries, and other natural barriers. In addition to buying up and re purposing property to protect the city, a panel commissioned by the Governor suggested planting oyster beds in the harbor to protect from storm surge. Both of these plans, building wetlands and planting oysters, were proposed quickly after Hurricane Sandy and it is interesting that, what seems like for once, a government official is taking climate change and a need for green solutions seriously. 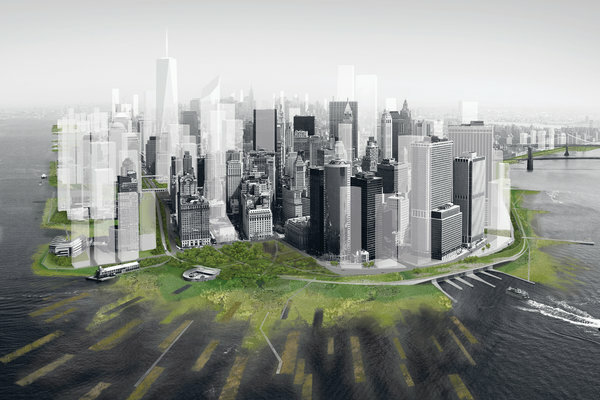 A rendering of lower Manhattan with wetlands to protect against storm surge. Published on Nov. 3, 2012. It will be interesting to see the reactions of New York residents to Governor Cuomo's plan- and it might set the tone for our nation's ongoing battle with a rising ocean. Will 10-15% of the 10,000 homes open to the buyout actually take it? And if enough homeowners don't, to what lengths will the state go to protect its citizens and its infrastructure from the oncoming tide? Kimmelman highlights the Dutch way- the government gave no recourse to citizens, instead moving them out of the region but giving them some choices about where they resettled (and trying to make other local areas available for those that didn't want to leave). Should flood prone and low lying areas in America start their relocation now? If the relocation could allow much needed infrastructure to be built, even if that infrastructure looks in fact to be a vacant lot, isn't it imperative that we relocate people to save as much coastline as possible? Regardless of feelings over relocation, Ezer et al. have highlighted the real issue: we are quickly running out of time.